Sabrina Mahfouz to judge SLAMbassadors 2017! The judge of the 2017 SLAMbassadors Youth Slam Championship is poet, playwright, educator and performer, the incomparable Sabrina Mahfouz. A legend on both the British and international theatre and poetry scenes, Sabrina has a passion not just for writing and editing but also for inspiring a new generation of writers to reach their fullest potential – both on and off the stage. Her work includes the plays Chef, With a Little Bit of Luck, Clean, Battleface and the love i feel is red; the poetry collection How You Might Know Me; the literary anthology The Things I Would Tell You: British Muslim Women Write and the BBC shows Breaking the Code, Railway Nation: A Journey In Verse and We Belong Here. She received a Fringe First Award for Chef and won a Sky Arts Academy Poetry Award, which has allowed her to develop substantially as a writer. She recently collaborated with fellow spoken word star Hollie McNish on the play OFFSIDE about women in football. She has performed and read her poetry globally, from Palestine to New York and is the undisputed finest writer of character poetry in the UK. Her gigs are incredible, and we are delighted to announce that not only will Sabrina Mahfouz judge the competition but will also perform a headline set at the SLAMbassador National Finals on Sunday November 19th. If you want to be one of the 6 UK youth winners who will share the stage Sabrina Mahfouz then you have until September 30th at midnight. Pick up your pen, pick up your mouth, and start making sense. Full information on entering here. 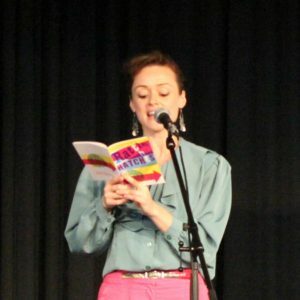 Listen to SLAMbassadors Artistic Director Joelle Taylor in conversation with Sabrina Mahfouz in this Poetry Society podcast.